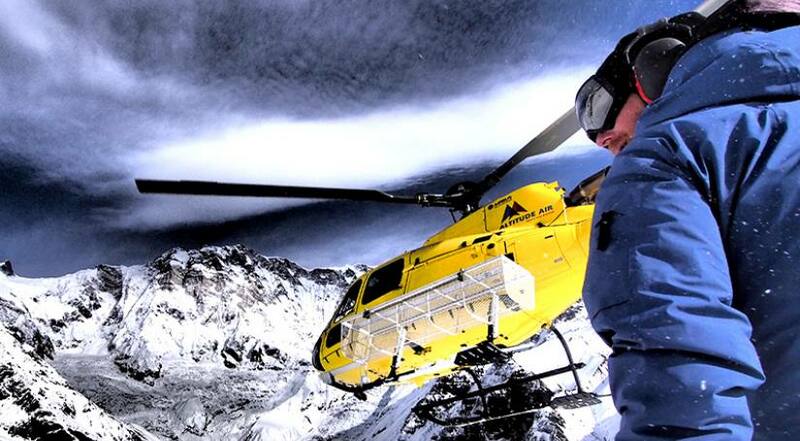 The Luxury short Everest Base Camp Trek with Helicopter flight from Base Camp to Lukla is the adventure of a lifetime, a journey for those whose dreams fly higher than even the clouds. Miles from cars, conveniences, and daily luxuries, you'll saturate your spirit in natural beauty and stretch your personal endurance beyond what you thought possible. The path begins in ancient Kathmandu, where you'll acclimate and explore the city at your leisure while anticipating your ascent. 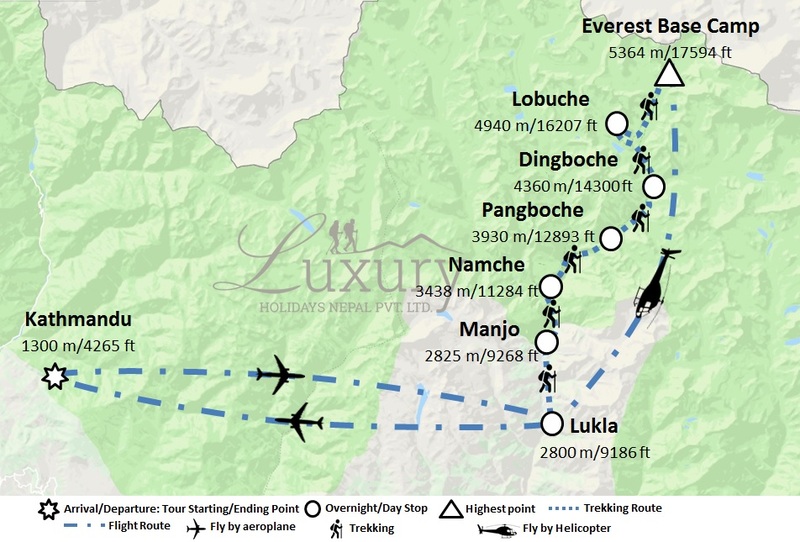 Next, we take a short flight to Lukla and hed to Phakding. We enter into Sagarmatha National Park from Monjo and trek to Namche. During our walk in Sagarmatha National Park, we experience alpine species of flora and faunas. We pass Tengboche, Periche and Lobuche and arrive at Gorekhshep. Our climb to Kalapatthar offers us mesmerizing mountain panorama including the top of the wolrd, Mt. Everest. We further head to Everest Base Camp, the wolrd highest base camp, and discover more about the entire region. On returning, we take a helicopter flight to Lukla to escape all the way back on the same trail. From Lukla, we again take a short flight to Kathmandu to end our Luxury Short Everest Base Camp Trek with Helicopter flight from Base Camp to Lukla. After arriving in Kathmandu, a representative from Luxury Holidays Nepal will pick up from the airport and take to your hotel. 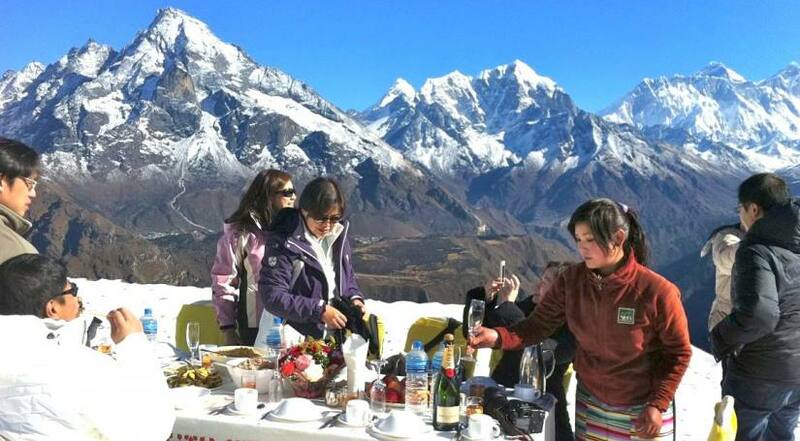 In the afternoon, you may take a rest or visit Luxury Holidays Nepal’s office. At evening, we host a pre-trip meeting at your hotel in Kathmandu and introduce your tour and trekking guide. Please seek this opportunity to ask questions about your trip. This includes a final briefing and preparations for the trip. For the meeting, please make sure you bring your passport, two copies of passport-size photos, and a readable copy of your travel insurance policy. During this meeting, please clear the due balance, if any. Please inform us in advance if you will be arriving late and therefore are unable to attend the pre-trip meeting. An early morning start takes you to Tribhuwan International Airport in Kathmandu for the 30-minute scenic flight to Tenzing and Hillary Airport at Lukla at 2,804 m/9,199 ft. On arrival at the airport, guide will brief you and introduce your porters before your trek begins towards Manjo. After landing, you will explore the village while Sherpa crew sort and load our trekking equipment. Then the trek begins by descending towards the Dudh Kosi River where you join the main trail to Namche Bazaar, located just above Chaunrikharka (2,713 m/8,900 ft). The walking is easy. After passing through the small village of Ghat, it is a short walk to Phakding and then to Manjo. After breakfast, your trek starts. You will continue trek along the banks of the Dudh Kosi, crossing the majestic river many times on exciting suspension bridges laden with prayer flags. After entering Sagarmartha National Park, the trail climbs steeply with breathtaking views. 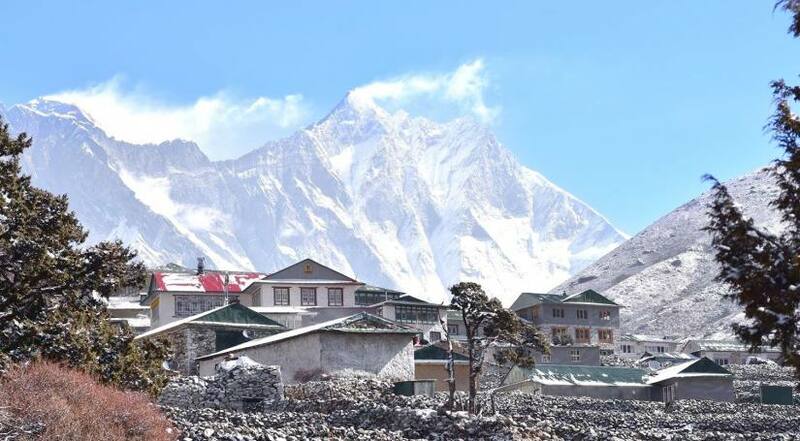 Namche Bazaar is known as the Gateway to Everest, which is home to many quality restaurants, hotels, lodges, shops, money exchange, internet cafe and a bakery. Namche is one of the biggest villages along the whole Everest trail. After breakfast, your trek starts. The trek continues along the rushing glacial waters of the Dudh Kosi with magnificent views of the mountains. The trek will end at an altitude of 3,930m / 12,893ft. On reaching Tengboche you will see the local monastery. Inside, the monastery is incredibly ornate wall hangings, a 20-foot sculpture of Buddha, and the musical instruments and robes of the Lamas. From Tengboche, the trail drops to Debuche crosses another exciting suspension bridge on the Imja Khola and climbs to Pangboche village. The trail continues along the lateral moraine of the Khumbu Glacier and passes by stone memorials for climbers who have perished on nearby summits. Continue to climb as you are heading to the altitude of 4,910m / 16,018ft at Lobuche, which is really just a few huts at the foot of the giant Lobuche peak. Note: None of the lodges in this village has attached bathroom facility. We will keep you at the best available lodge. You will take the trail to Everest Base Camp. Continuing straight ahead, across the Indian army mountaineers' memorials. The path from here can be misleading; hence, it is important that to follow your lead Sherpa diligently. The walk is strenuous due to the thin air in the high altitude. You will pass through rocky dunes, moraine and streams before reaching the Everest Base Camp. Upon reaching the Everest Base Camp, you will see the tents of mountaineers that stand out in bright colors against the monotony of gray surroundings (especially in the spring). Nuptse, Khumbuste and Pumori are the mountains you can view from the base camp. You will get back to Lukla by Helicopter from Everest Base Camp. Catch an early morning flight to Kathmandu after your long mountain journey. After reaching Kathmandu, you can take a rest or do some souvenir shopping. If you want to explore any other areas of Kathmandu. Your guides can help you with both souvenir shopping. There will be a dinner and half hour massage in the evening to celebrate the successful completion of your journey. Half hour massage and dinner for last night at 5-star Hotel.